The Lilly Library is the central facility for the College’s library, media and IT resources. The building was constructed in 1962 and named the Lilly Library in honor of Eli Lilly and J.K. Lilly and to gratefully recognize the contributions of the Lilly Endowment, Inc. to the strengthening of higher education throughout the United States, particularly in Indiana and at Earlham College. The building has been very flexible and over its fifty years has been revised in layout and expanded. While the building was built to include Media Resources, it wasn’t until the early 1980s that Computing Services was moved into the building. In 1991-92 a major renovation occurred in conjunction with the Francis and Viola Anscombe Addition. 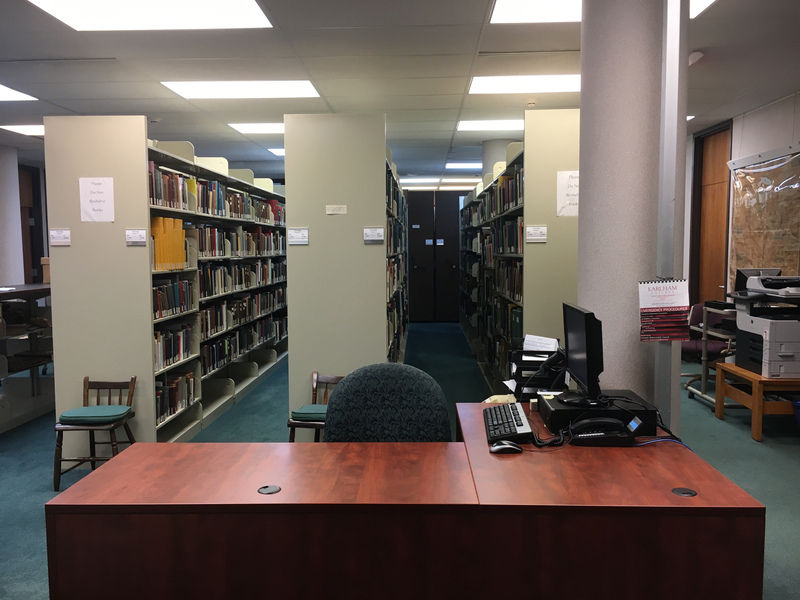 This project provided an upgraded space, better facilities for Media Resources and Computing Services, and established the Arthur S. and Kathleen Postle Friends Collection & Archives and the Hugh & Sara Ronald Gallery. The Library was designed to provide a comfortable and inviting atmosphere in which to study and read. 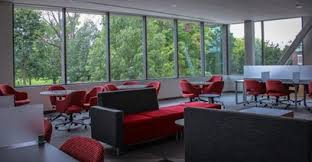 The building has 61,000 square feet of space on three levels with a diverse set of study environments: lounge chairs and couches, individual carrels, tables, and group study rooms. The building includes multiple computer labs. The Science and Technology Commons (STC) is our library nexus to the Natural Sciences. It serves an integral role in the science curriculum of Earlham College and its instruction and research programs. It provides students with the skills needed to access and use information resources relevant to course assignments from the Natural Sciences division, and it provides our faculty with spaces and services that support their teaching and research. The Science Commons is located in and throughout the Center for Science and Technology (CST). It is part of an intricate set of connected spaces, within a system of connected buildings and people, that actively support a mindset of community partnerships, collaboration, and active creativity where interactions and constructivist collisions are fostered among community members. The Science Commons aspires as a place to be a source for scientific inspiration where our science community can engage in innovative and exemplary teaching, and thrive in research and learning. The STC thrives to be a place where collaboration, discovery, and deep learning in the sciences is supported. We provide spaces that are quiet, noisy, pleasing and comfortable. For example, in the first level we have our main Circulation/Help Desk, our Science Colloquium/Shared classroom space, and our main student collaborative study area. In the second level we have our Science Commons Reading Room a key space for our students to engage in quiet reflection and independent work. In the third level we have our newest technology enhanced active learning environment, the Fishgold Science Commons Computer Lab. Adjacent to the lab we have the Science Commons study lounge (probably with one of the best views of campus), and a series of group study areas. Our hope is to be a living example of successful integration of science-information-technology and scientific interdisciplinary work. We strive to be a fundamental place where scientific discovery and technology integration in EC’s science teaching, research, and learning environments is supported and fostered. 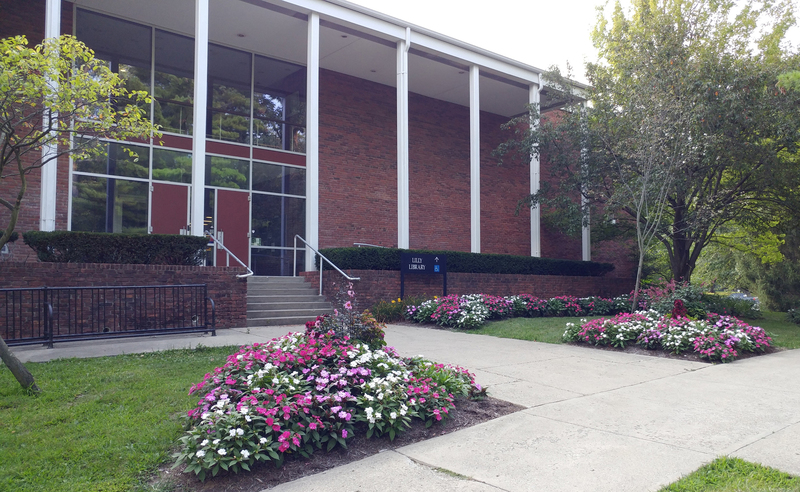 The Arthur and Kathleen Postle Archives and Friends Collection are named for the late Arthur Postle and his wife, Kathleen, the latter the donor who served the College for many years as a member of the faculty. The Friends Collection has one of the four or five largest Quaker Collections in the world, with more than 13,000 books and nearly as many pamphlets, some going back to the 17th Century when the Society of Friends was founded. These works are supplemented with an extensive collection of Quaker genealogical materials. Personal diaries, letters, and detailed records of monthly and yearly meetings reveal the lives of thousands of Quaker men and women. Documents and Earlham's rare book collection are preserved under climate-controlled conditions. Some of these date back to the Middle Ages, and many are too fragile or rare to be housed on the open shelves. The Friends Collection draws hundreds of scholars and genealogists to Lilly Library annually. The College Archives keeps alive the institutional memory of Earlham. The Archives preserves all the material that is judged to be of historical significance for Earlham and Earlhamites. The many files include official records; collections of publications, such as the College's first printed catalog of 1858; Opinion Board papers dating back to its founding in 1948, and complete runs of the campus newspapers since 1873. The collection includes such interesting and diverse objects as the ink well used by Earlham's first president, Barnabas Hobbs. Chairs on display in the Archives today are the same ones used when the student dining hall opened in 1847.